Samizdat Blog: Auden! Eliot! Perloff! Lorca! Campiness! Revolution! Apollinaire! — The New Battersea Review Goes Live! Auden! Eliot! Perloff! Lorca! Campiness! Revolution! Apollinaire! 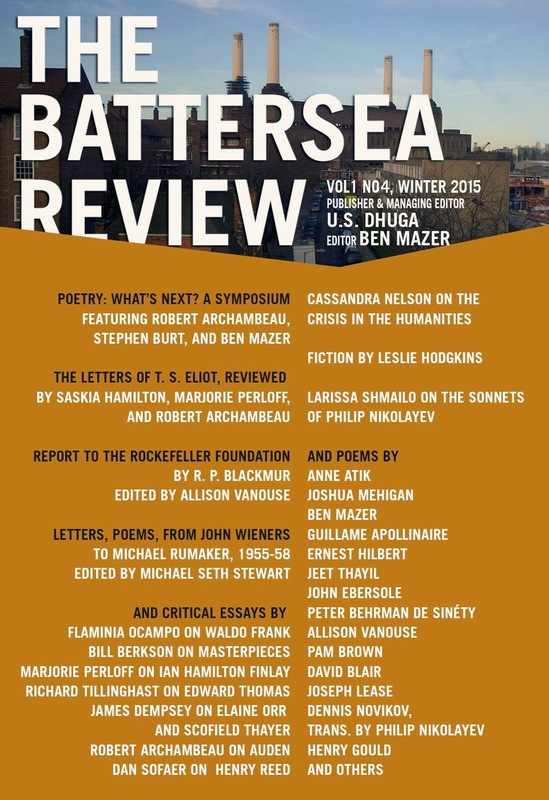 — The New Battersea Review Goes Live! I swear to what gods may be, I know of no literary journal as committed to in-depth criticism and analysis of poetry as The Battersea Review, the latest issue of which has just gone live on the internet. Great poems, deep archival materials, exciting translations—and some of my favorite critics (multiple pieces by Marjorie Perloff, as well as Richard Tillinghast and Stephen Burt)... and three things I wrote—one each on Auden & Campiness, the young T.S. Eliot, and the future of poetry. Check it out! A new translation of Federico García Lorca'a "Dark Love Sonnets"